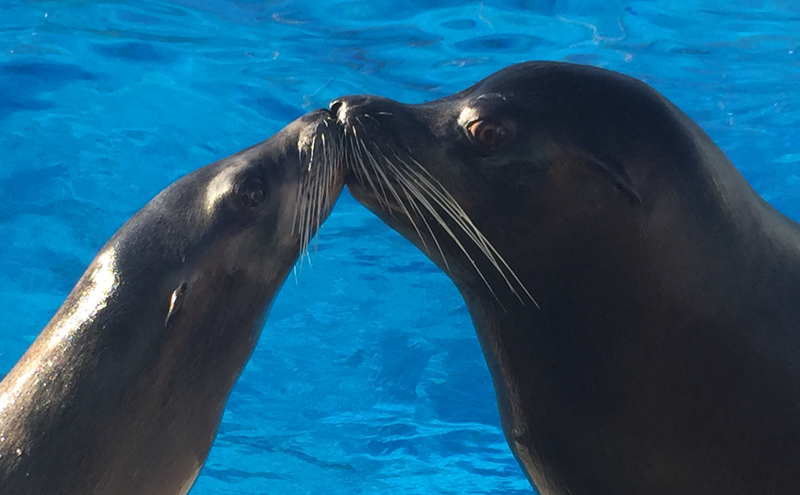 Bring together two kissing sea lions, a pair of love birds and the married couple that makes it all possible, and you’ve got a recipe for Valentine’s Day at Six Flags Great Adventure. This weekend, three special couples will celebrate their love Six Flags-style – California sea lions Kenobi and Dichali, blue and gold macaws Eugene and Ariel, and their caretakers, animal training supervisors David and Jessica Peranteau. Animals brought Dave, a Philadelphia-area native, and Jessica, an Ohio native, together 19 years ago when they were both hired as marine animal trainers. The couple married in 2000 and has traveled the world working with land and marine mammals ranging from tiny hedgehogs to massive orcas. The two settled in New Jersey at Six Flags Great Adventure in 2004, and have developed thriving animal education programs in addition to nurturing and training more than 100 exotic animals, including hand-rearing capuchin monkeys, otters, lions and bears. They have a five-year-old son, Noah, who knows that animals are part of their family. Noah even shares his birthday with the park’s first-ever baby sea lion, Magoo, who was born June 25, 2014. “I feel like I have two children born on the same day,” Jessica said. Each morning when the sea lion trainers arrive for work at Fort Independence aqua stadium, they find California sea lions Kenobi and Dichali snuggled up together, sound asleep. Although sea lions are not monogamous by nature, these two have developed a strong bond and enjoy spending the majority of their time together. 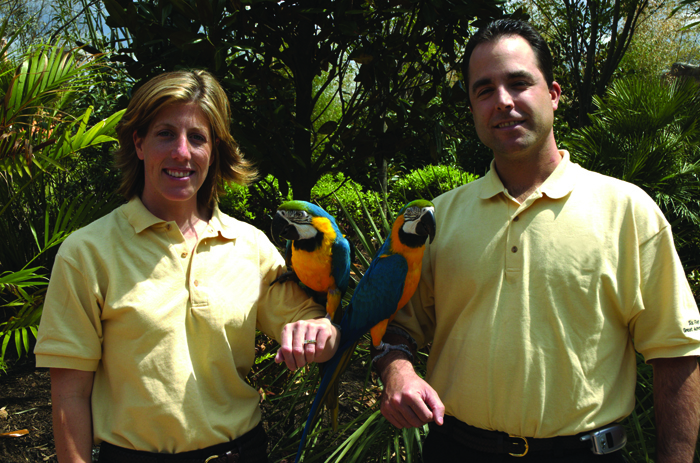 The flippered couple serves as an integral part of the theme park’s animal education program, displaying natural and learned behaviors. One of their most memorable behaviors is a kiss. Kenobi and Dichali often give kisses to each other, and occasionally share that moment with special guests and their trainers. 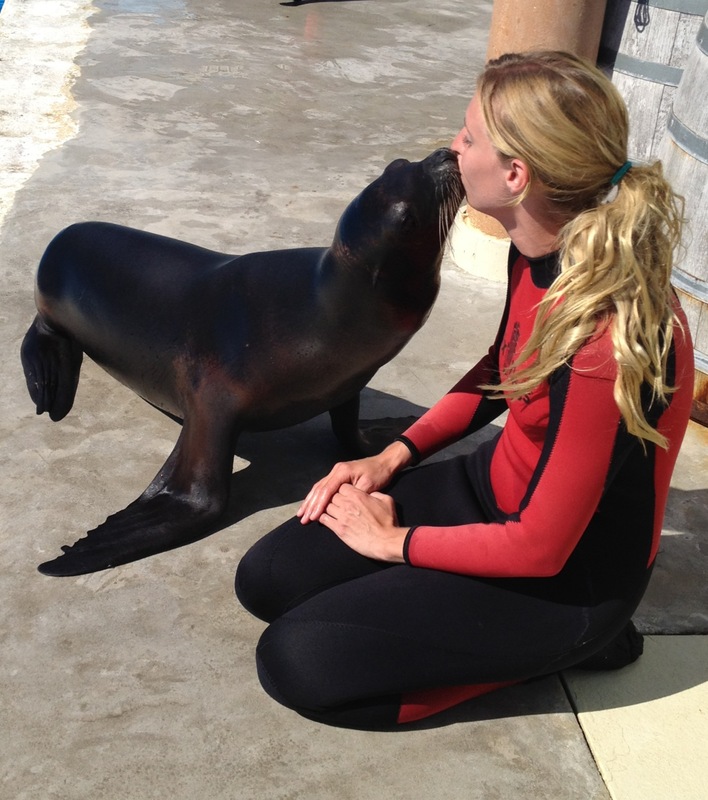 Jessica Peranteau admits that there is something special about a sea lion kiss. “It is cold, wet, and prickly. 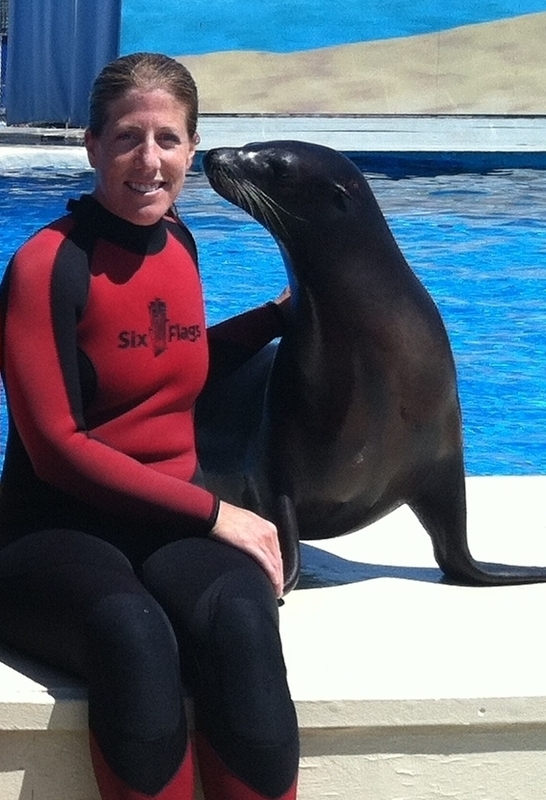 Add a few fish ‘breath mints’ and a sea lion kiss is something you will never forget,” she said. Cousins to seals and walruses, sea lions are native to the Pacific coast. Males can weigh up to 800 lbs., and although Kenobi is described as sweet and timid, the nine-year-old has a loud roar that earned him the nickname “T-Rex.” Dichali, who is eight years old, is described as extremely intelligent and loves to learn new things. “She loves to ‘test’ new trainers to make sure they are as smart as she is,” Jessica added. When you ask the Peranteaus to identify the most loyal and long-standing couple in their care, without hesitation they name Eugene and Ariel. They are a stunning pair of blue and gold macaws, whose species can be found in the rainforests of Central and South America. Blue and gold macaws are monogamous by nature and mate for life, so these two appear to be in their relationship for the long haul. “Eugene and Ariel are madly in love, and are both quite jealous creatures. Eugene clearly dislikes male trainers around Ariel, and although Ariel can be quite flirtatious with men, she can be rather rude to female trainers who get close to Eugene,” Jessica said. An attentive mate, Eugene often grooms Ariel’s feathers. The birds are in their twenties, and with an average life span of 60 to 80 years, appear to have several decades of companionship still ahead of them. Guests can see Kenobi and Dichali in the theme park’s Fort Independence arena, and Eugene and Ariel on the Safari Off Road Adventure, beginning April 3. For more information on Six Flags Great Adventure, visit www.sixflags.com/greatadventure or call 732-928-2000.